As is obvious, “Duluth” has a decidedly fragile and soft appearance. With this choice, the engineers increased the chances the drilling will work (which it did), while also getting themselves some data on the limits they face with this new drilling technique. It could be that they need more information for applying the right pressure with the robot arm, while the drill both rotates and hammers, and drilling first on a softer target allows them to get that information while taking the least risks. While this new test has obtained their first drill samples since October 2016, getting that sample into the rover’s test laboratories still requires refinement, as they will be doing it in a different manner than when the feed mechanism was working. Where Curiosity goes next is unclear. Eventually it will head back across Vera Rubin Ridge and up the mountain. When that happens remains a decision for the Curiosity science team. 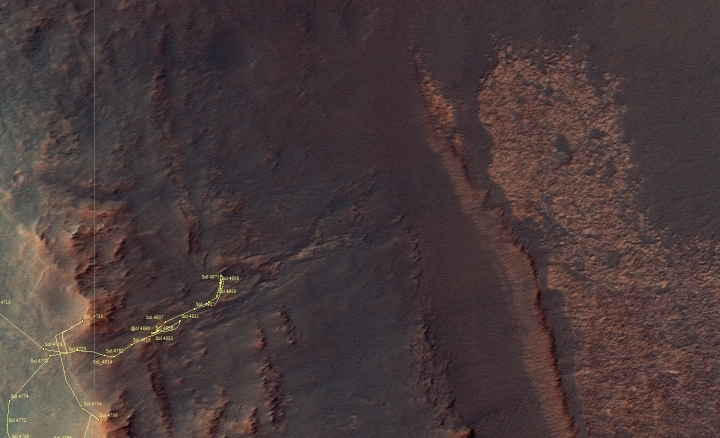 As it has since November 2017, Opportunity continues to sit about halfway down the rim of Endeavour Crater, inside Perseverance Valley, as shown on the traverse map above, taken on Sol 4997, almost a 100 sols back. Though winter is slowly ending, the rover’s travels continued to be somewhat restricted because of the limited sunlight available during winter to charge its solar-powered batteries. 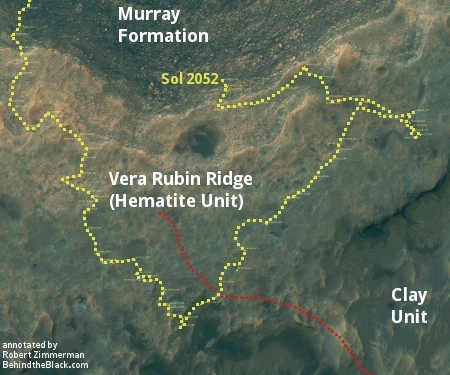 Nonetheless, they have been moving the rover up and down the valley, doing careful analysis of a variety of locations and rock types in an effort to pin down the geology that created this valley. After experiencing some slippage in an attempt to reach some “tablular rocks” uphill from the rover, as noted in my last update, the science team chose a different route and eventually reached them. Since then it has been taking close up images. The last sentence refers to coatings on some rocks that suggest some kind of interaction between the atmosphere and the rock’s surface. There is also the possibility, though quite slim based on the data so far, that some of the erosion features they have found might also have been caused by ice flowing downhill. This is not a favored theory, but it cannot be dismissed entirely. 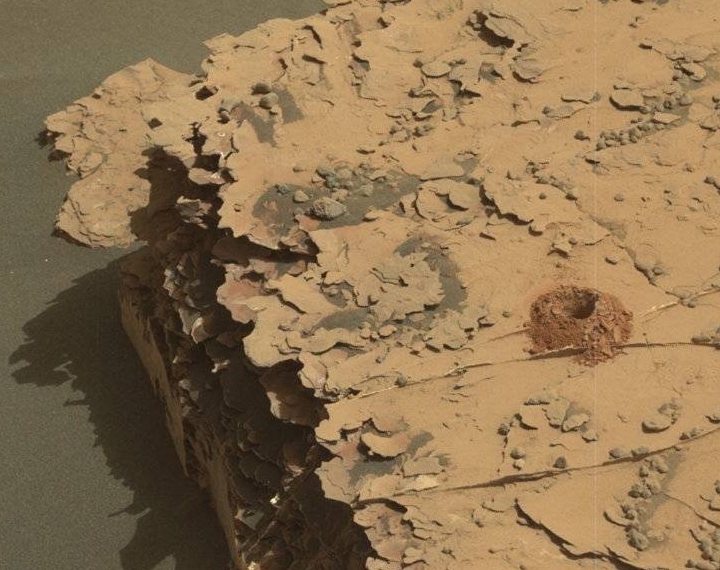 In other words, the geology here, even with a close look, is alien, and somewhat baffling. They pick at it as best they can, using a rover intended to work only 90 days that is now been operating more than fifty times longer, at a distance millions of miles away.